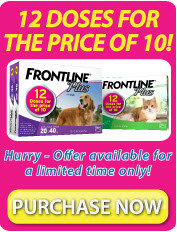 For a very limited time, we are offering all our customers the chance to purchase 12 doses of Frontline Plus for the price of 10! That means you receive 2 months of flea treatment absolutely free. Be quick and order now as this offer is only available while stocks last.